Whilst you can't respond to email directly on the Apple Watch (see episode SCOI0216), it's a great device for triaging your email. You can even setup alerts for VIP emails to be sent straight to your Watch. 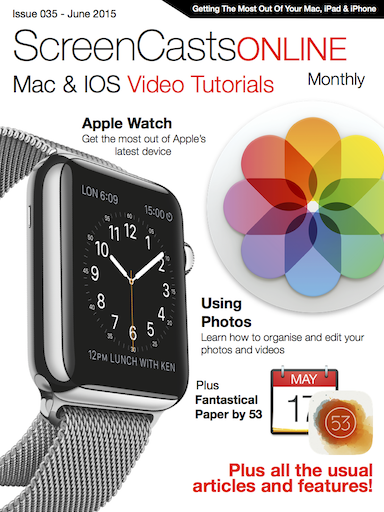 I also take a look at using Photos and setting up the Album to be sync'd with your Apple Watch. Finishing off with a look at using your Apple Watch to control music playback on your iPhone, as well as how to sync and play Music directly from your Apple Watch using a Bluetooth headset. Ember & Pixa - Organise Your Images tutorial is also available to watch in Issue 35 of the ScreenCastsOnline Monthly As a Premium member, this back issue may be available to you for free, or if published before you became a member, is available for individual purchase as a back issue in the ScreenCastsOnline Monthly Mag application.